*Note: The title refers to Šibenik, Croatia, being the first city in the world illuminated exclusively by hydroelectric power. Croatia’s most famous favorite son, Nikola Tesla, invented the alternating current generator now used in power generating plants throughout the world. 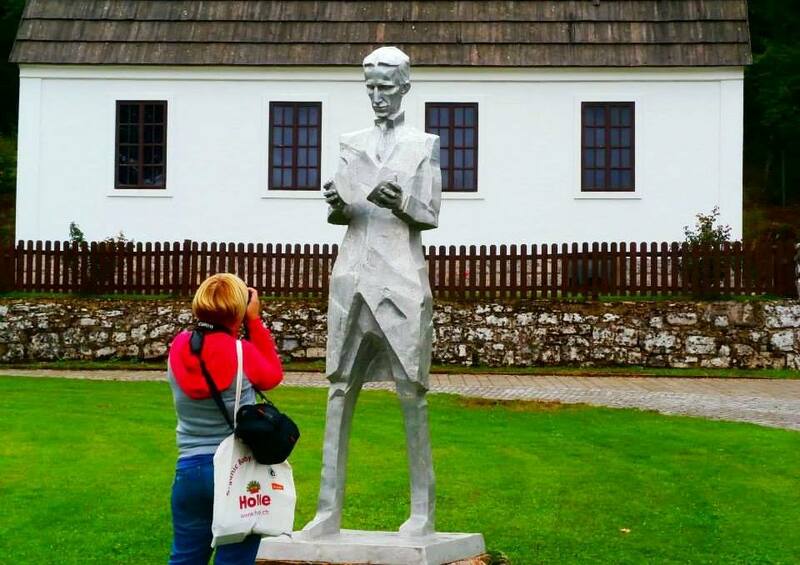 This statue of Tesla sitting outside his childhood home near Smiljan, Croatia, is nearly life-sized – he was 6’4″ tall. As we prepare to move to Šibenik (SHE beh neek), Croatia, several followers have commented things like, ‘You guys are The 6 Monthers. Are you going to change your name to The 3 Monthers?’ No, we are not going to change our name. Our plans have always been flexible and six months in a country is a guideline, not a rule. Coming to Europe our original destination was Ireland. 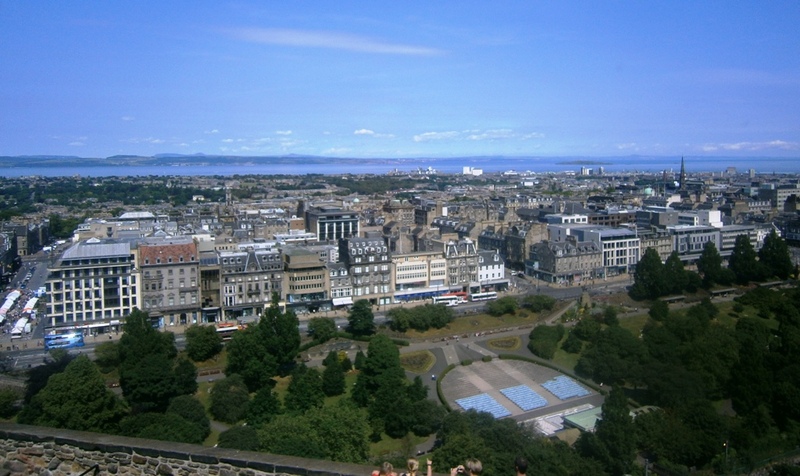 When the people we attempted to connect with for housing did not respond, we expanded our search to include Scotland. The same thing occurred as we were leaving Panama last January. Originally, we were going to move to Costa Rica. No one responded to our inquiries about an apartment there, so we expanded our search to include Mexico. Our decision to move there is one that we never regretted. Florence had visited Ireland on her first trip abroad thirty years ago. Scotland represented an opportunity to explore someplace new for both of us. 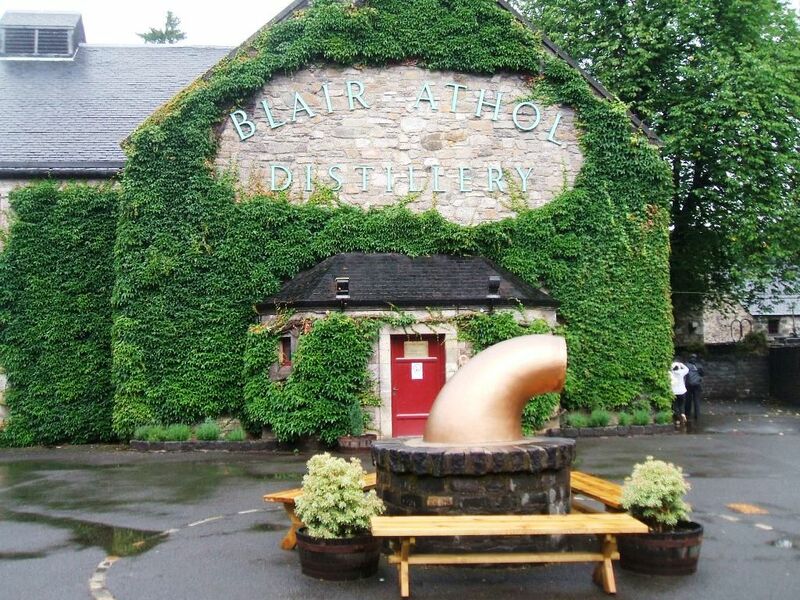 We had an amazing summer in the land of bagpipes, Scotch whisky, kilts and castles. 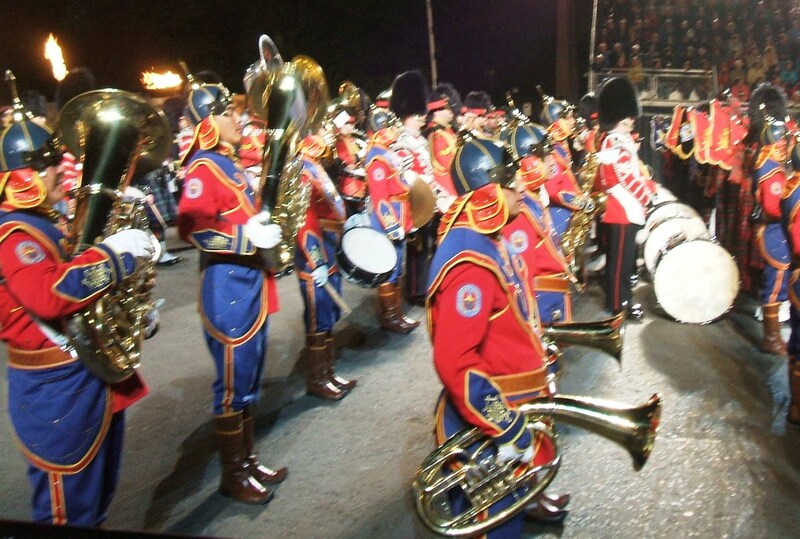 We attended the Royal Edinburgh Military Tattoo at the Edinburgh Festival. 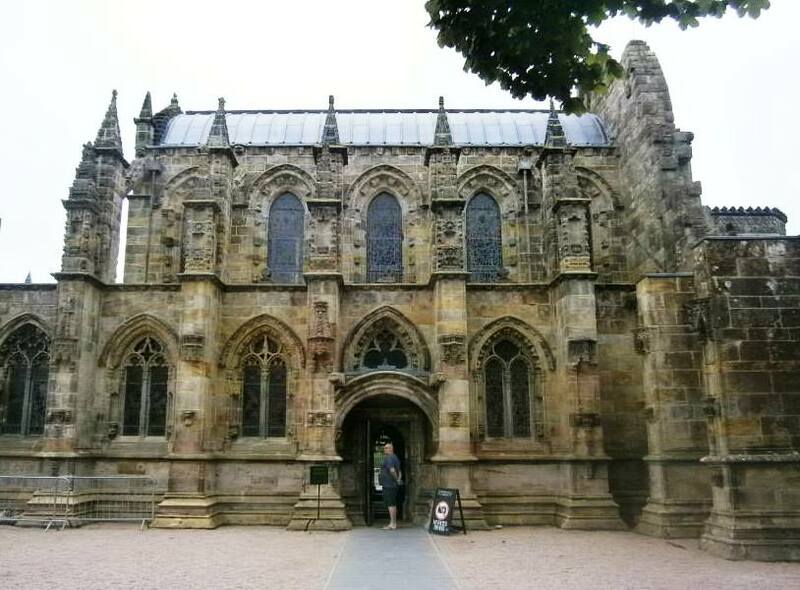 Among the many churches we visited on the ABC Tour, we saw Rosslyn Chapel, the 500 year old church made famous in Dan Brown’s The DaVinci Code where some of the movie was filmed. The offer to visit Croatia as journalists in September was an unexpected opportunity. We knew almost nothing about Croatia except that they and Romania were the newest members of the European Union. We discovered a country more beautiful than anything we could have imagined. 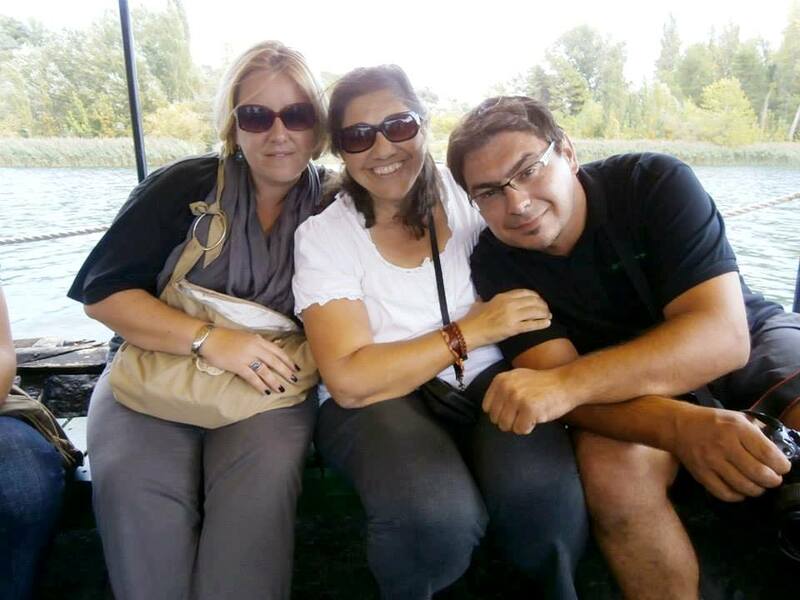 We met people with smiling faces and open hearts that welcomed us. We made friends that could hardly wait to see us again. When we returned to Scotland at the end of September the rain was regular. The days were colder and the nights were longer. Popular attractions were closing for the winter. When the opportunity came to finish out our current six months back in Croatia, it was a no-brainer. The days are 20° warmer than Scotland, and we will save nearly half on our monthly expenses compared to the cost of living in Scotland. We made new friends in Croatia. We had a great time in Scotland, and someday we hope to return to see some of the attractions we missed. This weekend we are headed back to lower latitudes on the lovely Dalmatian Coast. 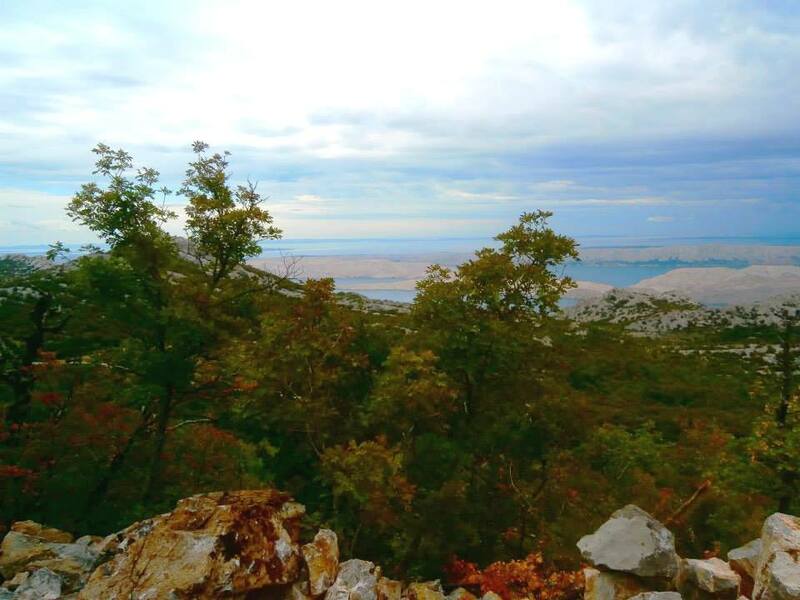 We will visit more of Croatia’s incredible sights. We will party with new friends. Then it is on to Spain in January where The 6 Monthers return to our regularly scheduled program to live in a new country every six months. At least that is the plan. 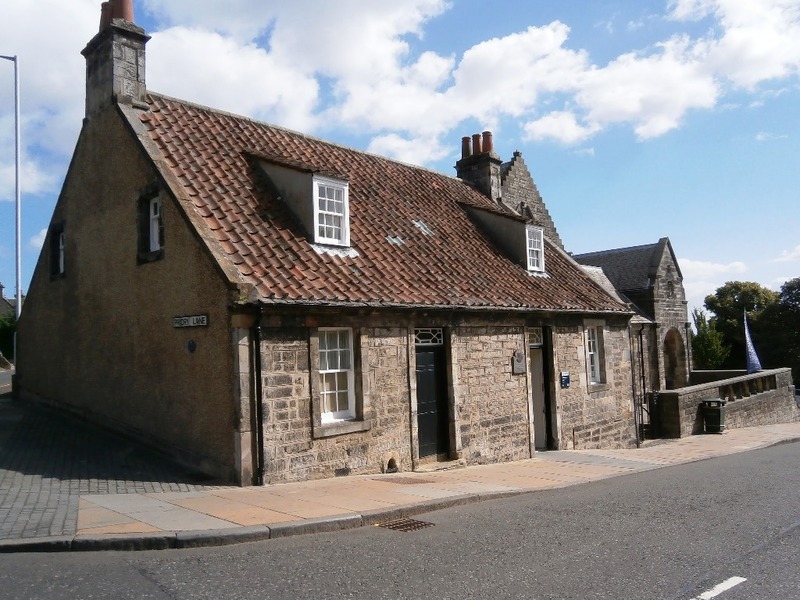 While visiting Dunfermline we discovered the Andrew Carnegie Museum which was built around the humble cottage where Carnegie was born. The story of his youth makes his rise to become the richest man in the world* all the more intriguing. The Carnegie’s shared the top floor of this cottage with another family. 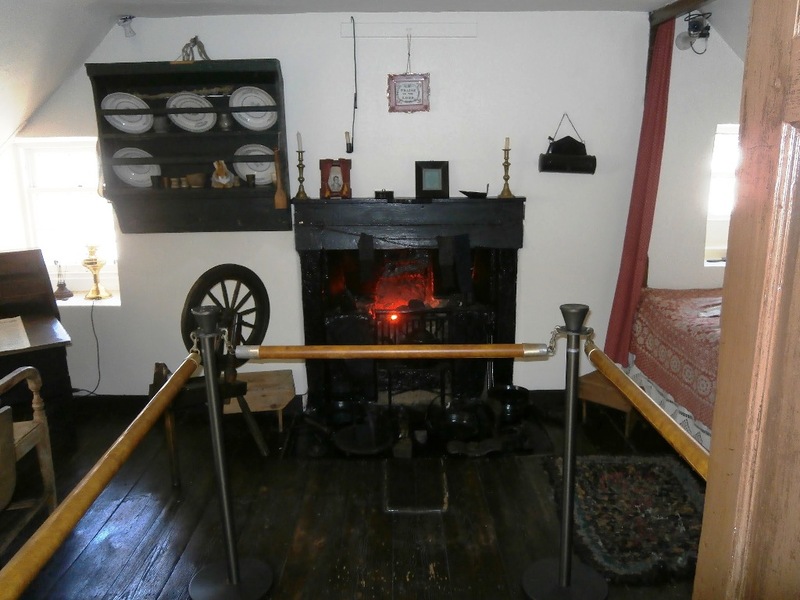 In addition to telling the life story of Andrew Carnegie, the museum preserved the humble one room loft apartment where he was born and where his family cooked, ate and slept. Another family occupied the room across the hall. The first floor space was taken up by hand looms. Andrew’s mother, Margaret Carnegie, worked to hand weave towels and linens. Once textile factories mechanized the weaving process, the Carnegies fell on hard times. Andrew Carnegie was born in this room, beds on the right, dining table to the left, no kitchen, no bathroom. Cooking was done at the fireplace. Against the wishes of Andrew’s father, Margaret decided they should emigrate to Allegheny County, Pennsylvania where she had a sister. Andrew was 12 years old when they made the journey. Although education was not mandatory, Andrew had voluntarily attended school starting at the age of 8 and learned the basics. He put his sharp mind to use on his first job at age 15. He earned $1.20/week as a telegraph operator where he became invaluable by being able to translate Morse code messages by ear without having to write down the words. 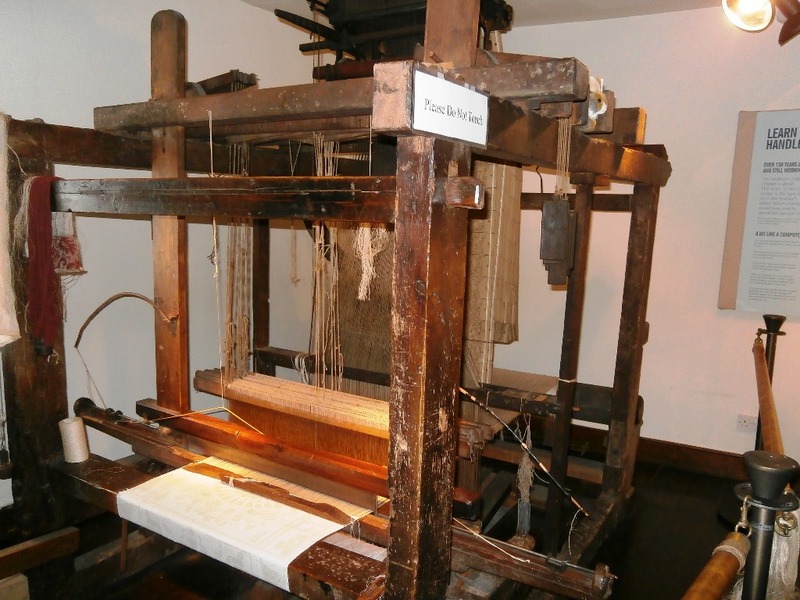 Two of these hand looms occupied the cottage’s first floor. Carnegie was hired as a personal secretary at $4.00/week at the age of 18 by Thomas A. Scott, owner of the Pennsylvania Railroad Company, one of the largest railroads in the country. Carnegie quickly rose to the role of superintendent of the Pittsburgh office. Carnegie’s relationship with Scott made possible an investment in Adams Express, which carried messages to corporate offices as they came in by telegraph. Margaret had to mortgage their house for $500 against its $700 value to make the payment. The investment paid off. Adams Express later grew to become American Express with Carnegie getting in on the ground floor. The outbreak of the American Civil War called for rapid, large scale expansion of the railroads. Carnegie did not invest in railroads. He invested in the companies who supplied railcars, locomotives and parts to the railroads. Carnegie used money from his investments to open a steel plant using state-of-the-art technology to sell rails to the railroads. He also invested in iron mines, shipping and refineries. 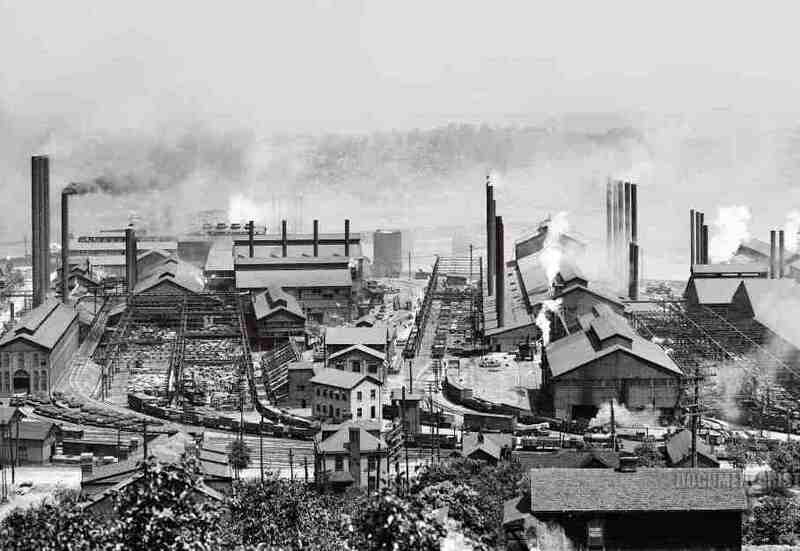 Eventually, Carnegie’s expanding steel empire threatened the future of other steel producers because he now owned the entire supply chain as well as the finished goods. 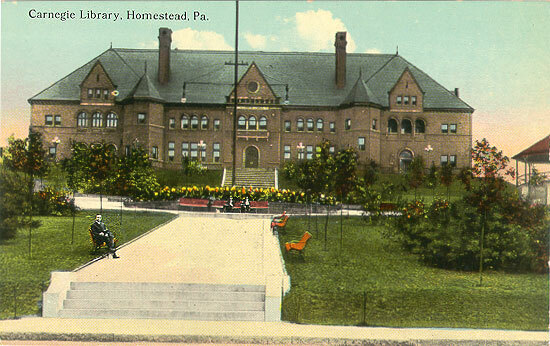 The library at Homestead, PA includes a swimming pool, a 1,000 seat theater and a bowling alley free for employees. In order to stop him from overtaking the industry, the steel producers needed an investor who had the funds to buy him out. John Pierpont Morgan envisioned an integrated steel industry with efficiencies based on consolidation and minimizing waste. In 1901, Carnegie was 66 years old and ready to retire, so he accepted the largest corporate buyout in history. J.P. Morgan paid Carnegie $480 million ($13.2 billion today) and U. S. Steel was born. Carnegie spent the next twenty years of his life funding public works including the building of over 2,800 public libraries. He endowed the Universities of Scotland with $10 million including scholarships for boys who could otherwise not afford a university education. The Carnegie Trust continues to endow numerous universities. 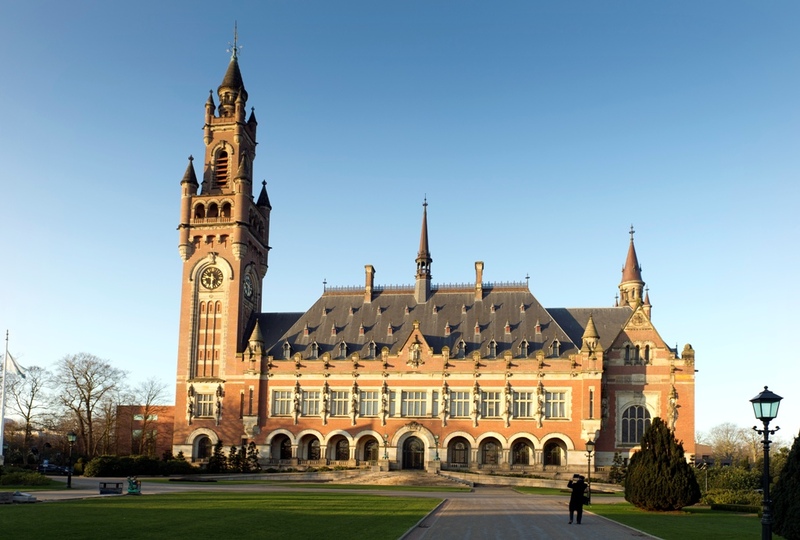 As a pacifist, Carnegie had the Peace Palace built at The Hague in The Netherlands, which today houses the International Court of Justice (The World Court), and is still managed by the Carnegie Trust. The Trust also supported the Children’s Television Workshop. The Carnegie Museum displays Bert and Ernie puppets to commemorate the Trust’s support for the production of Sesame Street, now in its 44th year and broadcast in 140 countries. 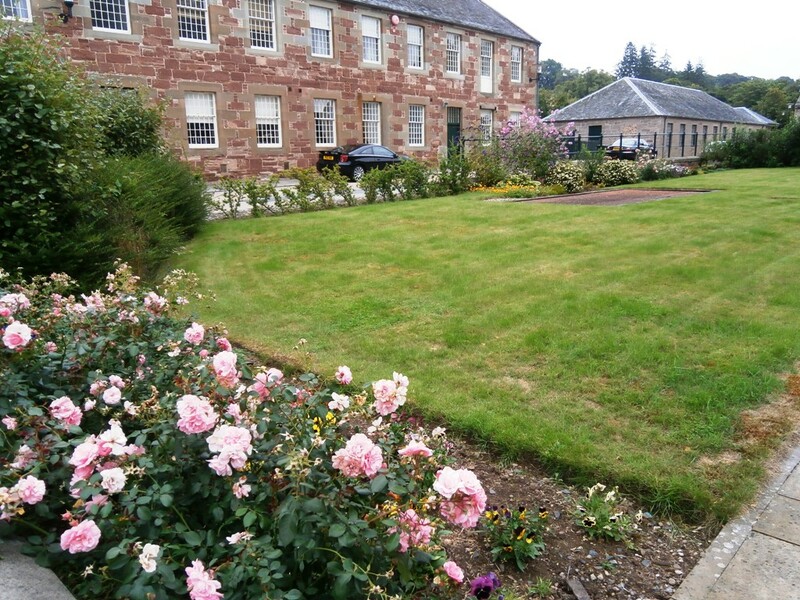 Growing up in Dunfermline, Carnegie was excluded from entering the nearby private Pittencrieff Estate. 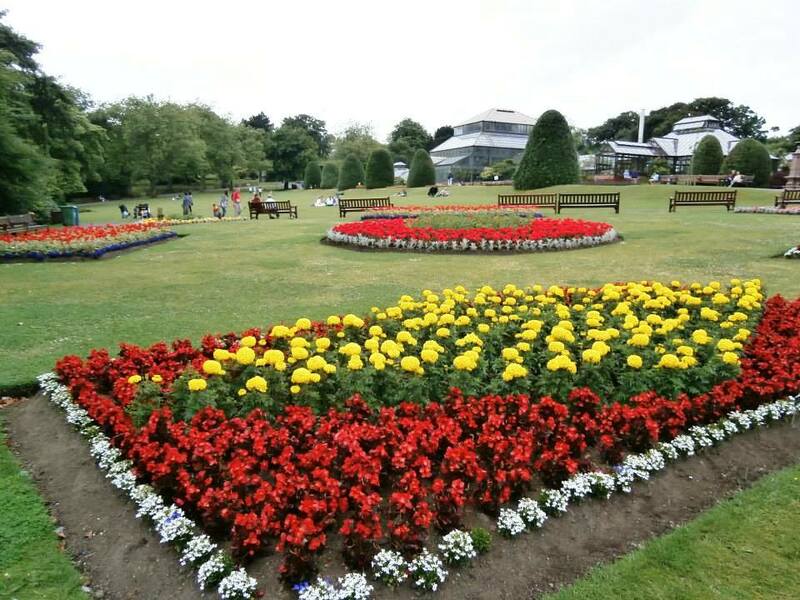 In 1902, Carnegie purchased the 76 acre estate and gifted it to the people of Dunfermline. 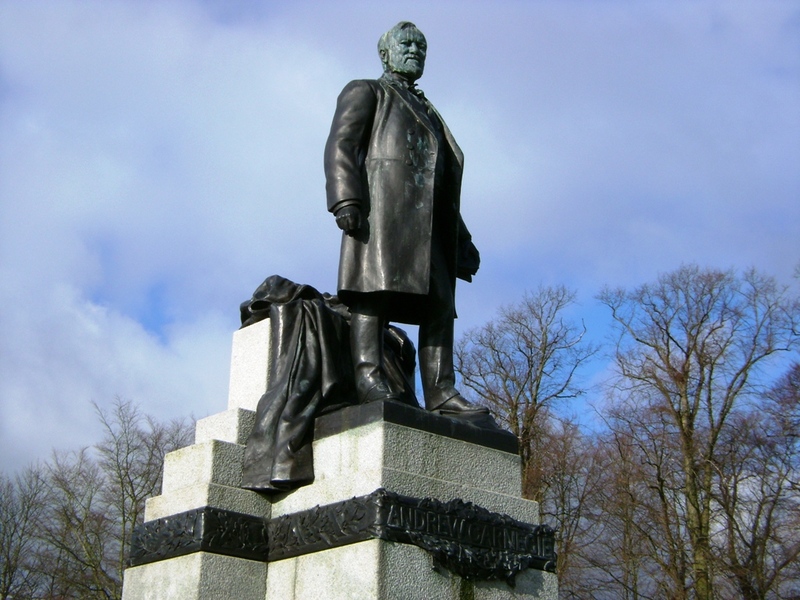 Today, as we depart Dunfermline, we pass Pittencrieff Park where now stands a statue of Andrew Carnegie, a self-made business mogul and philanthropist, a famous American and a favorite son of Scotland. *Note: Using CPI cost-of-living statistics, Carnegie’s net worth would have been $13 billion today. Using GDP figures to determine the costs of goods and services at the turn of the century, Carnegie’s purchasing power would be comparable to $165 billion today. We entered the Stanley Mills site on the same path used by employees for two centuries. 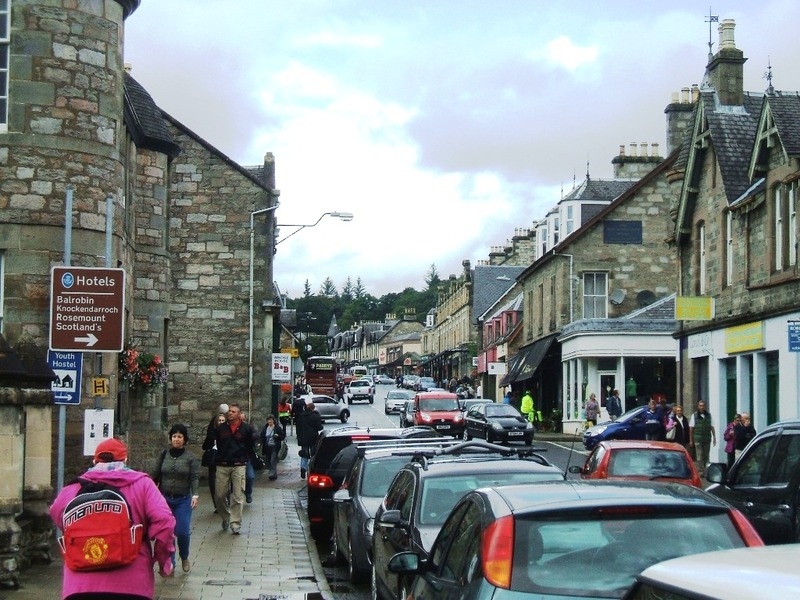 Just seven miles north of Perth is the village of Stanley, a town that was originally built to house mill workers in the late 1700’s. At the dawn of the Industrial Revolution, workers were drawn from farm labor to factory work. It was often the women and children who took the factory jobs at Stanley Mills to supplement their meager farm income, at least at first. Less than 400 workers were needed in the first years of flax weaving. However, over 2,000 workers were needed at the height of cotton weaving production. Carding tons of cotton required big machines. Some of the buildings had been vandalized and one building was lost to fire – perhaps arson. 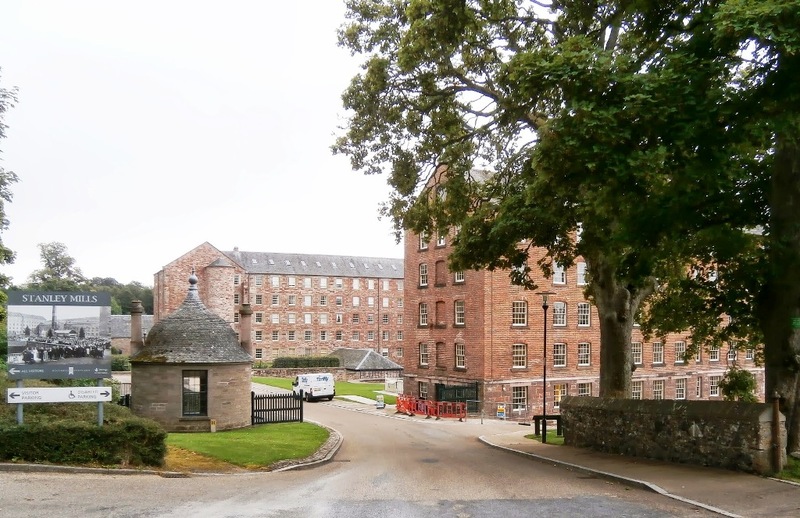 Historic Scotland took possession of the mills to preserve them for posterity. Interpretive displays and period carding and spinning machines are exhibited to help visitors picture what the textile workers’ daily lives were like. Much of the work was mind-numbingly tedious, like placing spools on spindles and threading looms. Factory noise must have been nerve wracking given the number of machines at work. Giant troughs housed waterwheels large enough to power the factory. 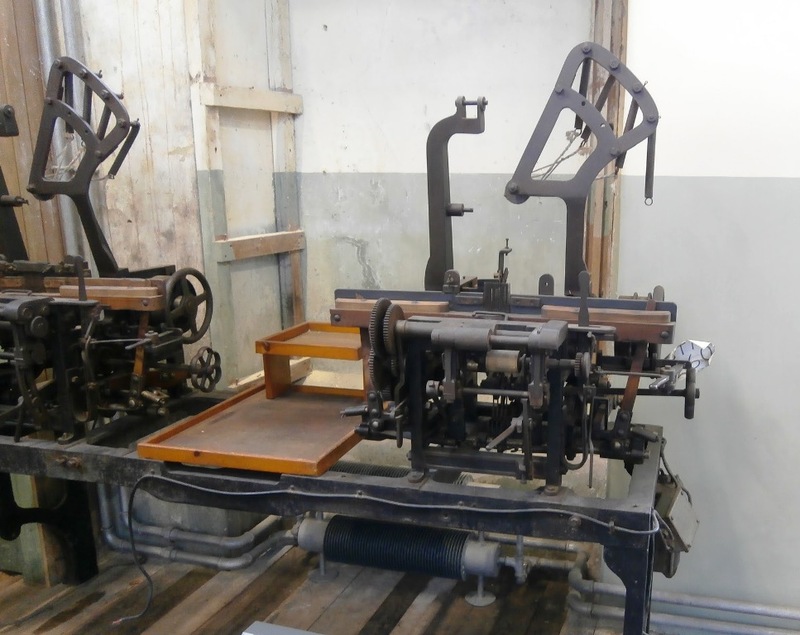 The mills increased production capabilities based on technological advances throughout the Industrial Revolution. At first, a giant water wheel turned belts connected to drive shafts on all four factory floors, each with its respective task. As cotton became the most profitable fabric, one floor was for carding the fibers, cleaning out impurities. Another floor began the spinning process to make threads of various thicknesses. The top floor was for weaving fabric on huge looms. The factory also produced continuous belts of various sized loops and thicknesses to ship to other factories for use as drive belts for their own machines. Cigarette factories were important customers for drive belts from Stanley Mills. 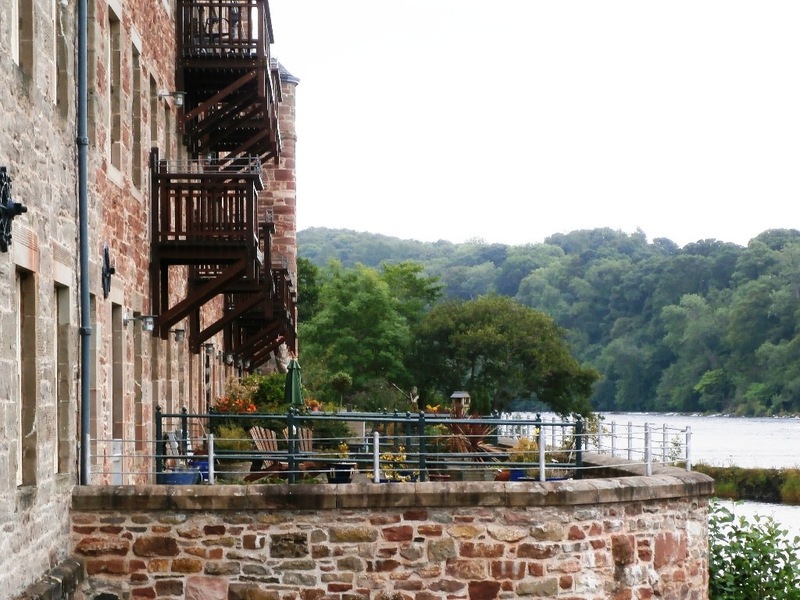 Stanley Mills condos now overlook the Tay River. 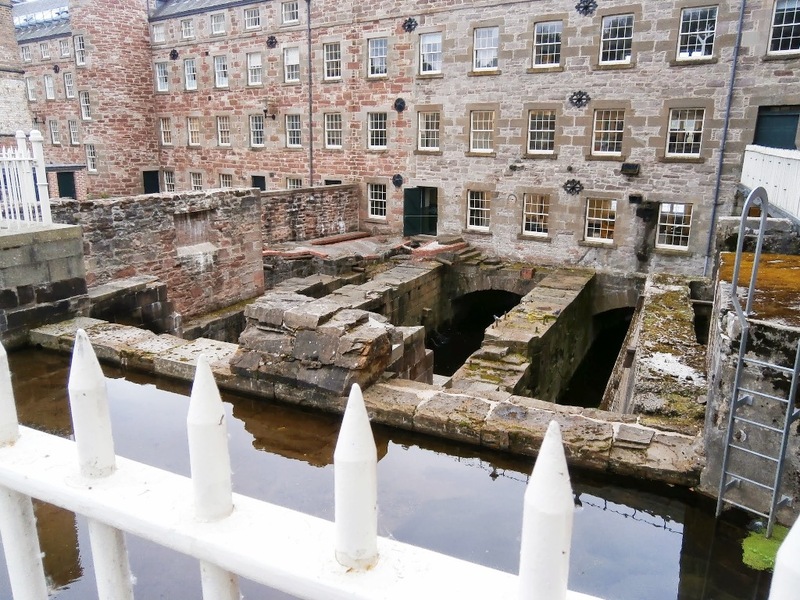 The water from the Tay River provided the mill with the energy required. Water tunnels were eventually built from upriver because the water level ebbed and flowed with the changing seasons. The water wheels were replaced with water powered turbines for a more efficient energy source, and in the 20th century the turbines drove generators that provided hydroelectric power. The mills went through several cycles of expansion and shutdowns based on fluctuations in the economy. When India gained its independence, they began their own cotton production and imposed tariffs on British cotton that cost Stanley Mills a huge market for their goods. Women wove belts on these machines. Skilled hands sewed the belts into continuous loops. Eventually, cotton was displaced by synthetic fibers as the favorite materials in the marketplace. 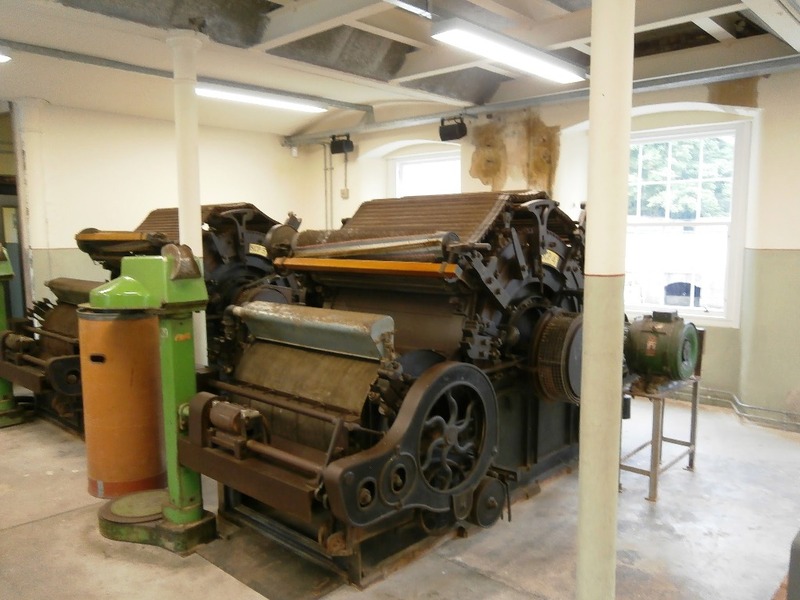 Stanley Mills made the conversion to synthetic weaving to keep the factory operating. Cotton made a comeback as a desirable fabric in the 1980’s, but the mill could not afford the cost of retro-fitting and Stanley Mills ceased operations in 1989. Today, some of the buildings have been refurbished to provide housing. The condominium units overlooking the river now sell for £125,000 GBP, about $193,000 USD, plus grounds maintenance fees. 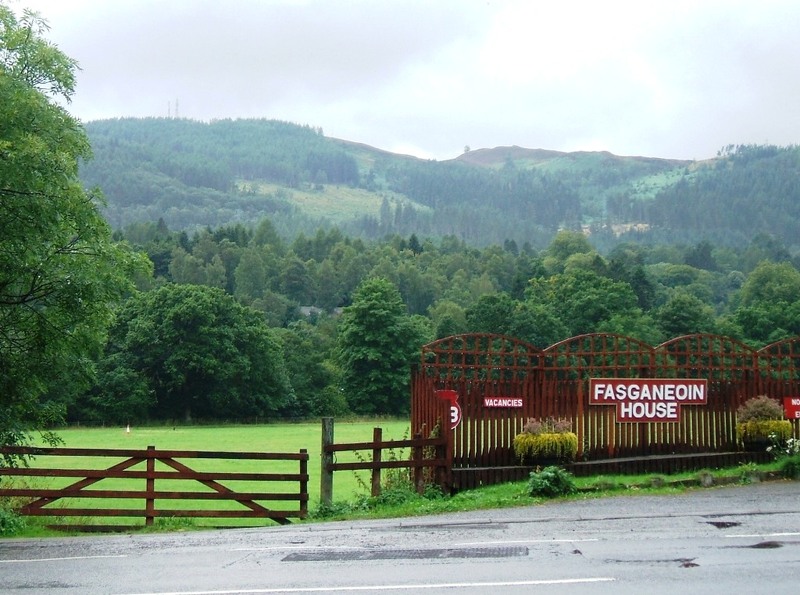 There are still units available for anyone who might like to live in this historic pastoral site overlooking the Tay River. Back in February I posted a story spelling out our finances for living in a new country every six months. Our plan is still to live on a budget of $1,500/month. That was not a challenge in Panama or Mexico. In Scotland, however, the cost of living is greater and so is the challenge to stay within our budget. 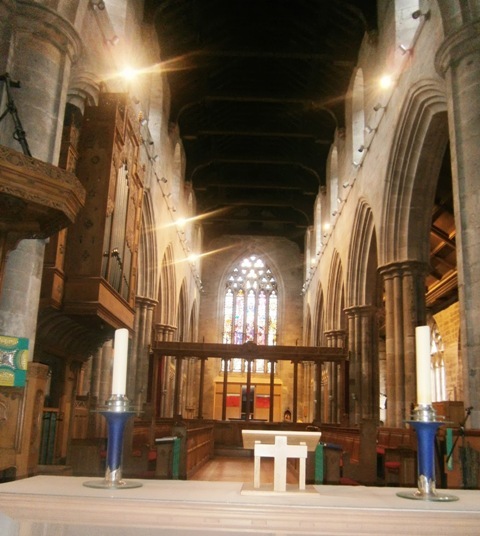 We are able to manage within our budget during our six months in Scotland, but it is a tight budget. We do not have much flexibility for extras, especially if anything unexpected should arise like medical expenses. 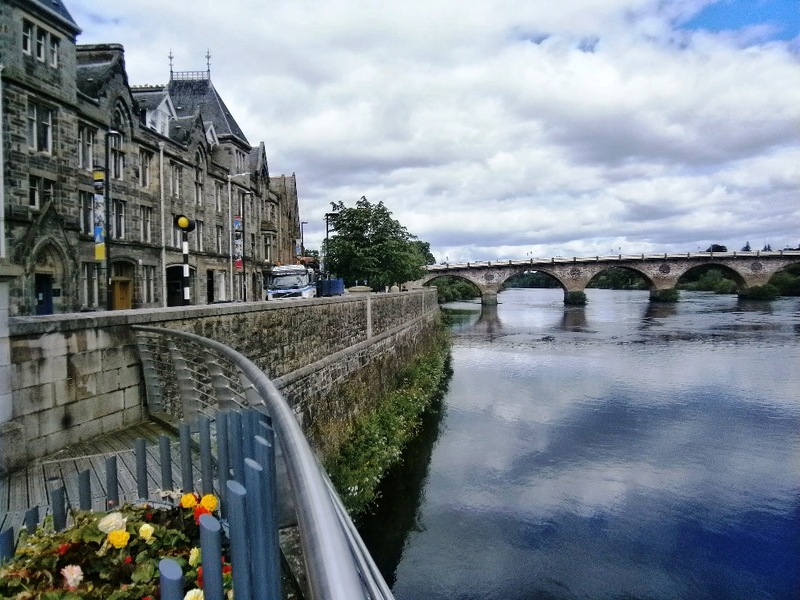 In fact, the cost of living in Perth, Scotland, is close to what it would cost in similar size cities in the United States. We will not have much of a budget surplus once we factor in the cost of our next move. Fortunately, our next destination of Spain is not that far to travel compared to our recent transcontinental move. The travel distance from Edinburgh to Madrid is about 1,100 miles, about the same as the distance from Vancouver, Canada, to Los Angeles. And flying is not only the fastest, but also the cheapest means to get to Spain. 1. Line up housing in advance. We thought we could find an apartment more easily than we did. Although we do not regret the sightseeing we did, we spent more than we wanted in order to wait to get into the apartment we found. 2. Confirm broadband internet service in advance. We could not get a contract for internet service without setting up a direct debit account in the UK, something we were unable to do as non-residents. We would have paid the extra expense to have the landlord set this up for us if we had known. The dongles (USB plug-and-play appliances that provide internet access via T-Mobile’s cell phone system) are on a 3G network. That is not broadband, and it will not support Skype. We have no complaints about Scotland. The water is good, the air is clean, the country is beautiful, and the people here are friendly. Plus, Florence and I are delighted that everyone here speaks English, although they do speak with quite an interesting accent. 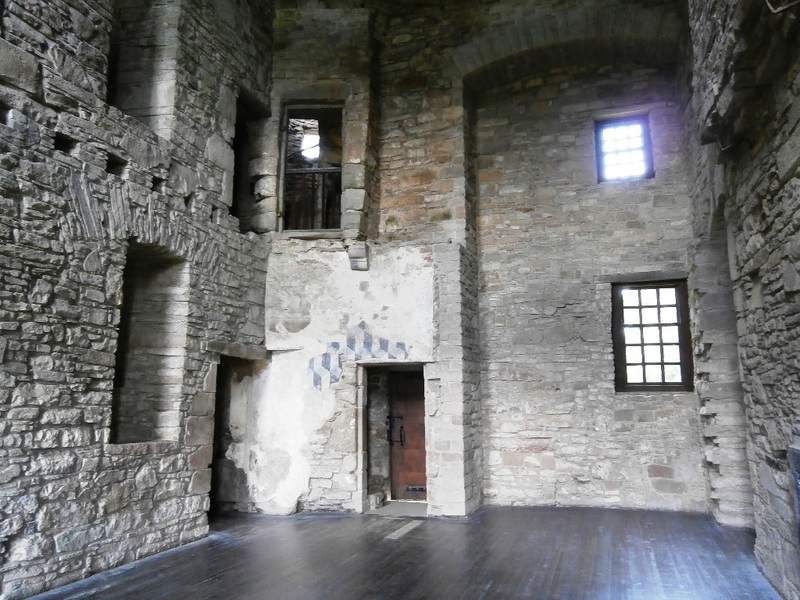 The architecture of Huntingtower Castle is unusual with two separate tower houses side by side. 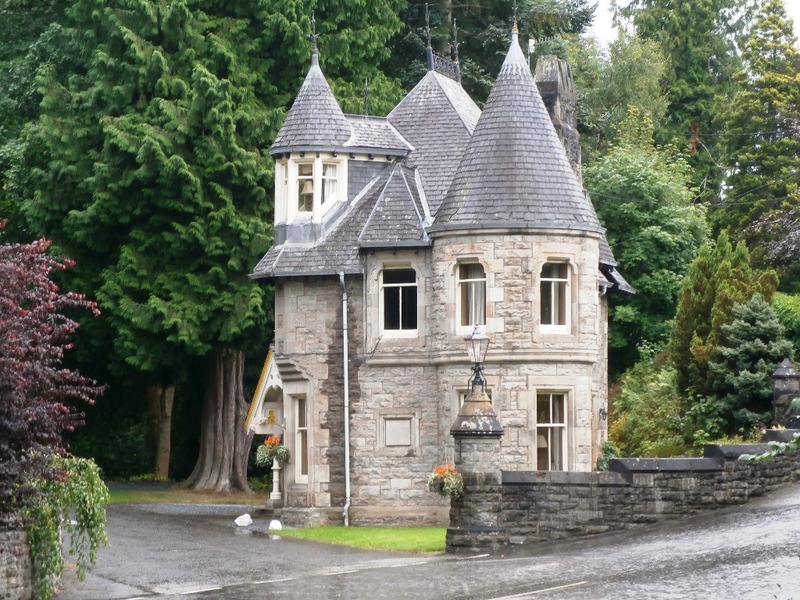 One thing you figure out quickly in Scotland is that there are dozens of castles throughout the country, and in many cases one need not travel far in order to reach them. Our first week in Scotland we signed up to become members of Historic Scotland for which we are granted free admission to many of the castles. 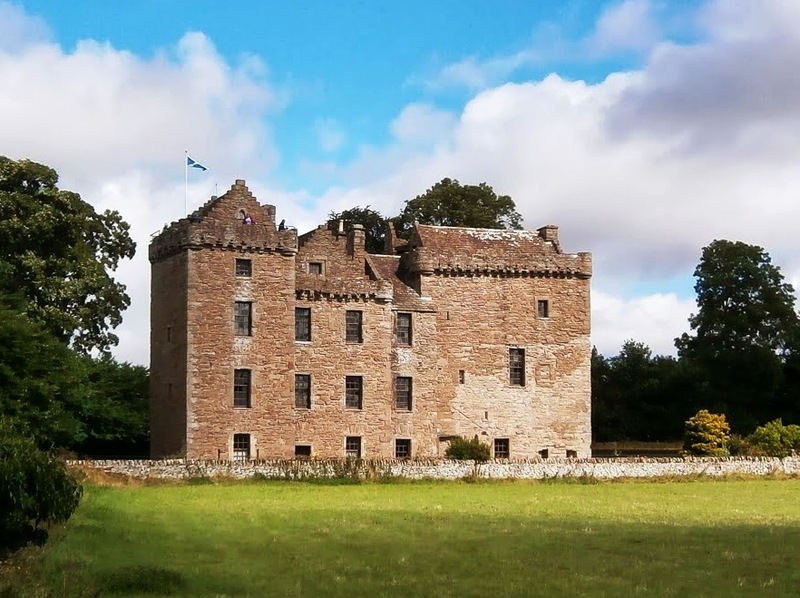 Today, we took a local bus just five miles out of our home city of Perth to the site of Huntingtower Castle. The gap between the two towers has been closed in. The walkbridge is just for tourists. The uniqueness of this castle is that it was built with two tower houses side by side but separated by a gap of a few feet. More recent renovations had the two towers joined into a single structure. The oldest part of the castle as it stands today dates back to the 1400’s. Prior to 1600 the castle was known as the Place of Ruthven. In 1480 the two sons of William, the First Lord Ruthven, were each granted letters of legitimacy, thus giving both heirs a rightful claim to the estate. 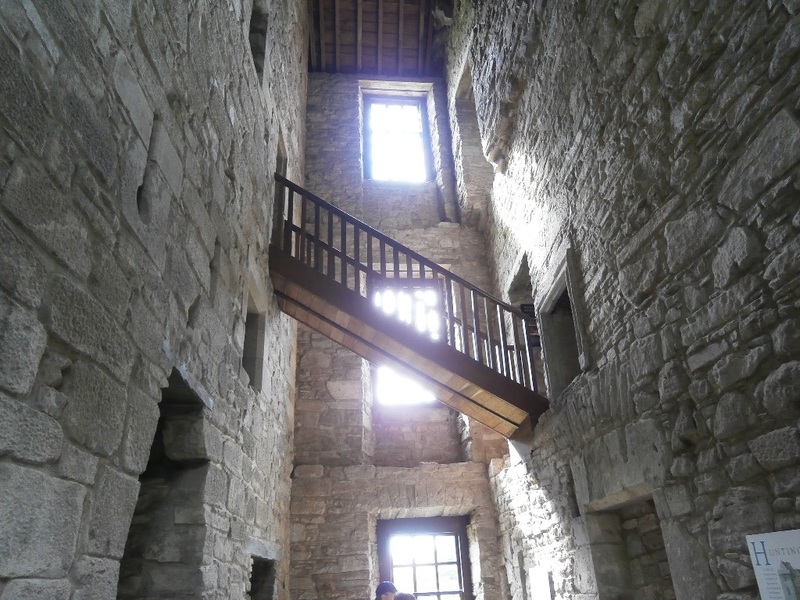 This rare occurrence may explain the building of two tower houses so close together – one for each son. 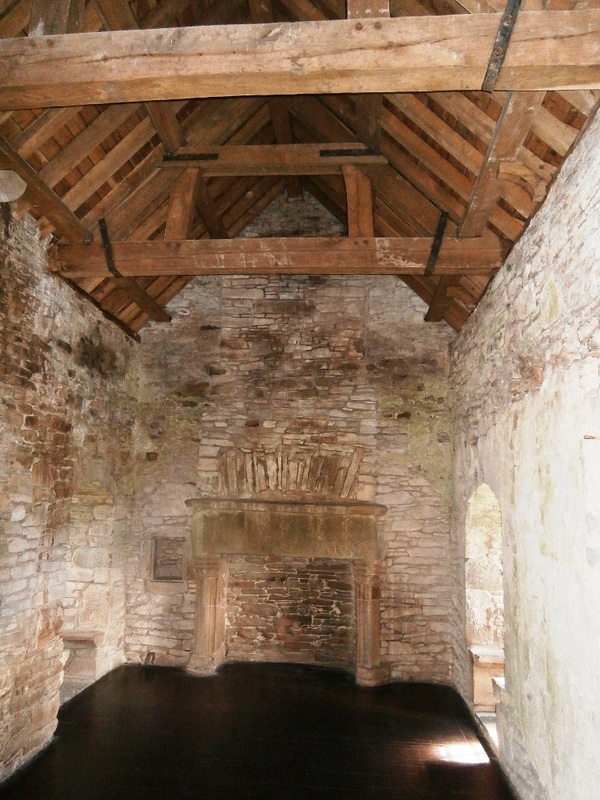 A floor once divided this room into two stories. The first floor was for cooking and cleaning. The 2nd floor was for dining and receiving guests. The reign of King James VI was an unstable time politically. Even though the king made the Fourth Lord Ruthven the Earl of Gowrie in 1581, a year later the earl captured the young king and held him for ten months as a prisoner in what became known as the ‘Ruthven Raid’. The dispute was settled and the king forgave his earl. More political intrigue followed, and in 1600 the Ruthven brothers, John and Alexander, were implicated in a plot to murder King James. The king had them executed and their families were forced to forfeit their land. 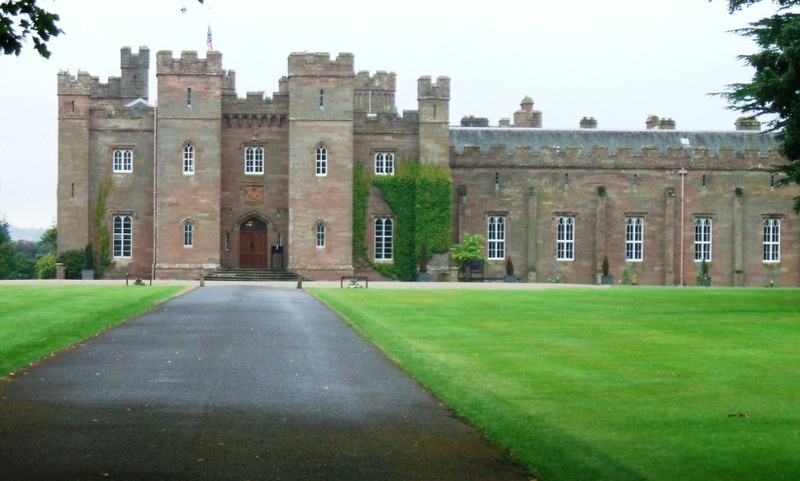 The king took possession of the castle and estate and renamed it Huntingtower. In 1643 he awarded the land and the earldom to the Murrays of Tullibardine. The top floor was the earl’s bedroom. A four poster bed sat along the left wall. The last of the family to reside in the castle was Lady Mary Ross, widow of John Murray, the First Duke of Atholl, whose realm included parts of what is now Perth. She died in 1767 and the castle fell into disrepair. Farm laborers occasionally used the site for shelter. Nowadays, the castle has become a popular site for weddings. The castle is now in the care of Historic Scotland and is open to visitors all year round. 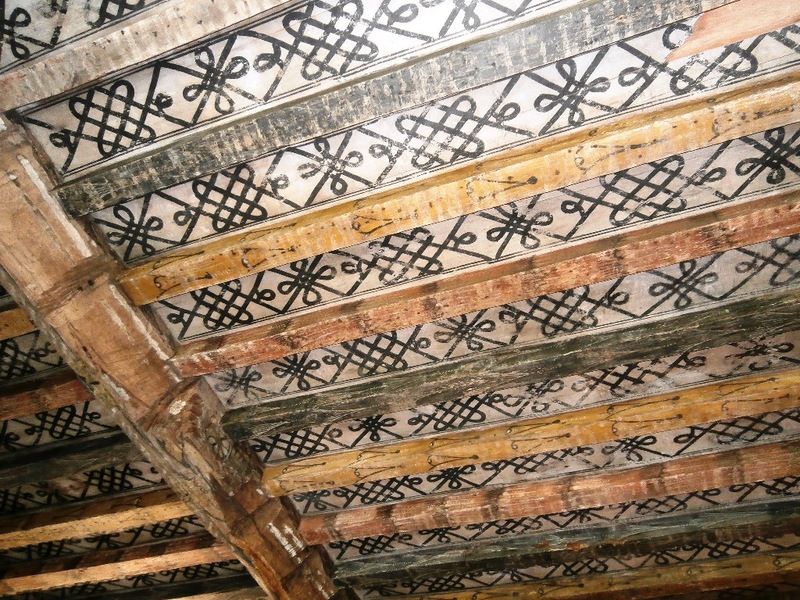 The most important historic feature of the castle is this medieval ceiling painted with pigments from the 15th century. 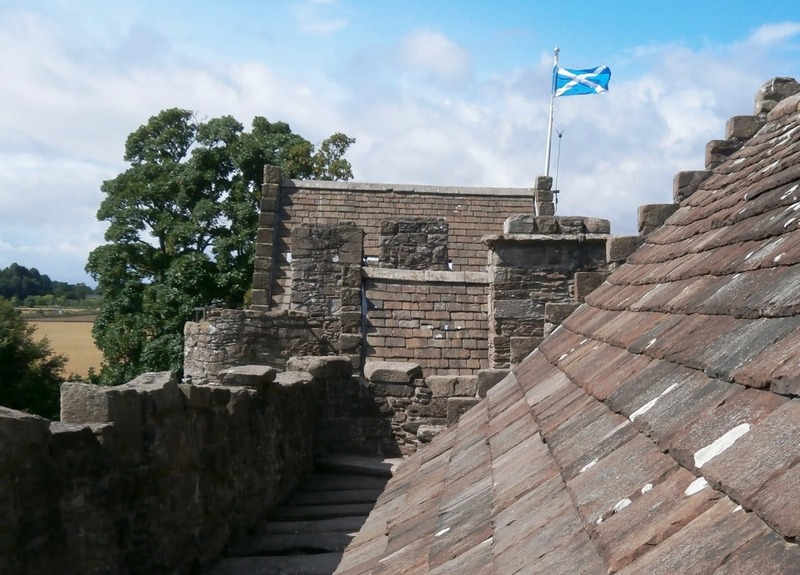 These days the cross of St. Andrew on the flag of Scotland flies over the ramparts. 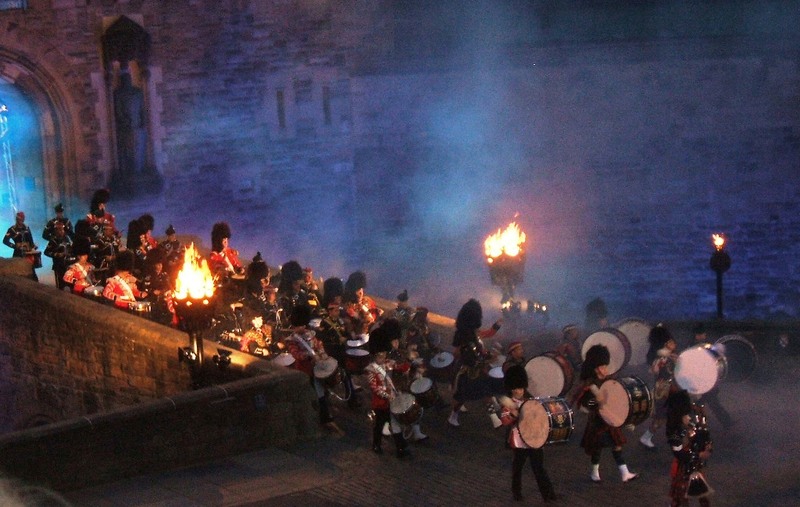 Scotland’s legendary Black Watch Regimental Pipe Band enters the arena from Edinburgh Castle. The original meaning of ‘military tattoo’ was a military drum performance. The term dates back to the 16th century in Holland. The Dutch Army was staffed mostly by mercenaries from England, Scotland, Germany and Switzerland with a Dutch commanding officer. Drummers were sent out each evening at 9:30 p.m. to inform soldiers it was time to return to their barracks. The process was known as a ‘Tap Toe’, a signal to innkeepers to shut off their taps and stop serving beer to the soldiers. 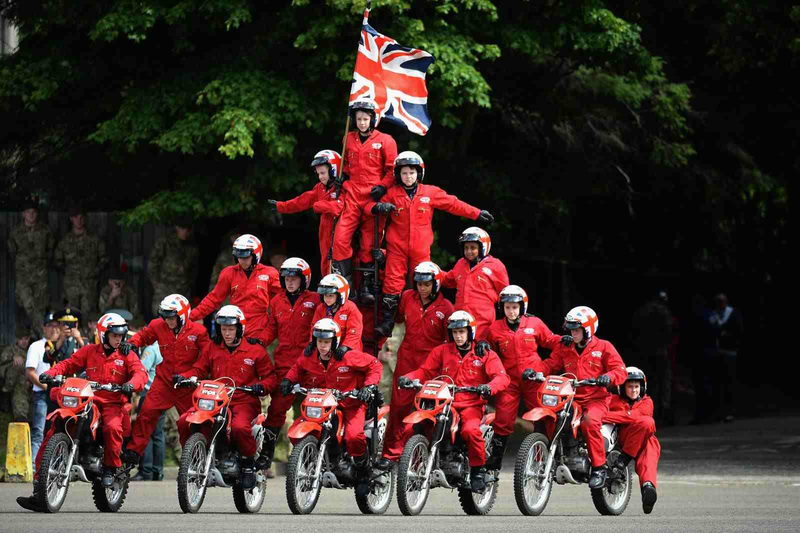 The boys’ precision motorcycle team from England warmed up the crowd. 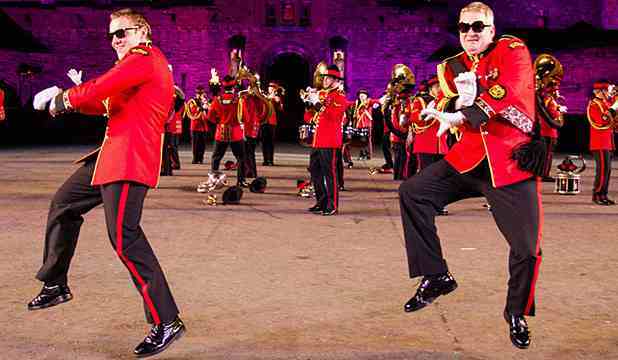 Nowadays, a tattoo is a performance by military bands for entertainment, and one of the world’s most prestigious tattoos is held outside the entrance to Edinburgh Castle every August as part of the festival known simply as Fringe, which we attended. The show featured groups from Korea, Mongolia, Mexico, New Zealand, South Africa, Canada, Australia, England and of course, Scotland. 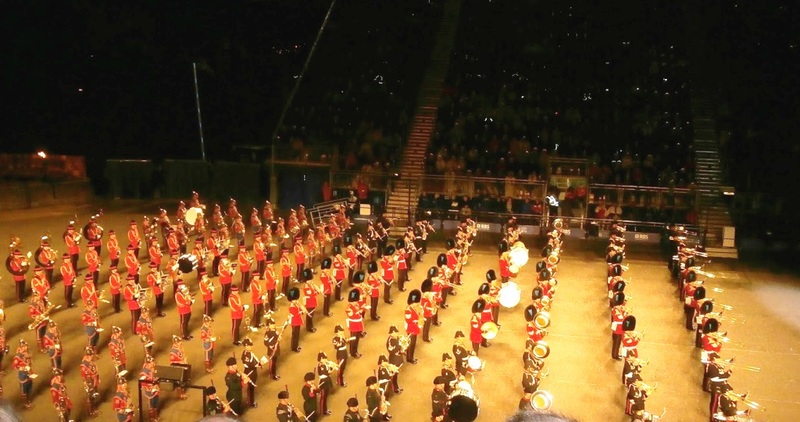 The massed band opened the tattoo with stirring pipe and drum numbers. The show opened with the massed pipe bands marching out from the castle onto the escalade while playing the bagpipes in unison. The collective musical force of fifty drummers and a hundred pipers is thrilling. It got the crowd fired up more than a Super Bowl halftime show! Following the pipers were the drum and bugle corps massed bands. There is nothing like marching bands in their dress uniforms to get the spectators energized. 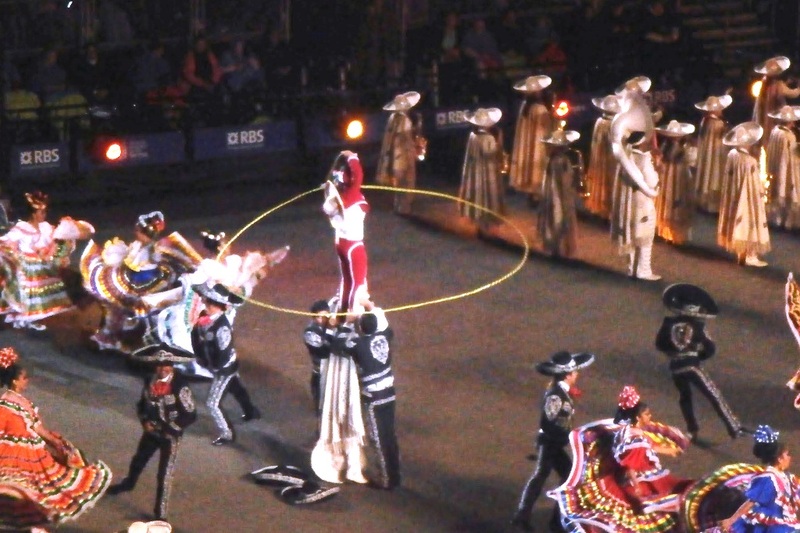 From Mariachi to fiesta dancing, the Mexico band livened up the show. The Mexican group opened with an Aztec-style fire dance followed by a musical fiesta featuring dancers in traditional bright colored dresses. The Mongolian band had the most impressive uniforms and their dancers performed a tribute to the great Genghis Khan, complete with period costumes and replica spears and arrows. The performers from South Korea contrasted with the power of the brass and pipe bands with a delicate dance with silk scarves and ballet-like choreography. Their presentation built to a crescendo of synchronized drumming that brought roars of appreciation from the capacity crowd of 8,600. The Kiwis go Gangnam Style. The New Zealanders stole the show with their energy. They started their presentation with the classic Maori haka or war chant. After a classic march they performed a drinking song where they staggered while playing, which drew laughs and cheers from the audience. They followed with the final movement of the classic Sousa march, Stars and Stripes Forever with six piccolo soloists. However, they completely won the hearts of the crowd when the trombone players set down their horns and danced Gangnam Style complete with sunglasses. The Mongolian uniforms were the most colorful. As if that were not enough, the women’s drill team joined the band. Their precision movements culminated in a double file crisscross performed marching backwards. I have seen some amazing dance and drill routines, but I had never seen that before! It was one thing keeping their lines perfect, but they did so while blind to the movements of their teammates while marching in reverse. No wonder the Kiwis won over the crowd so completely on this night. 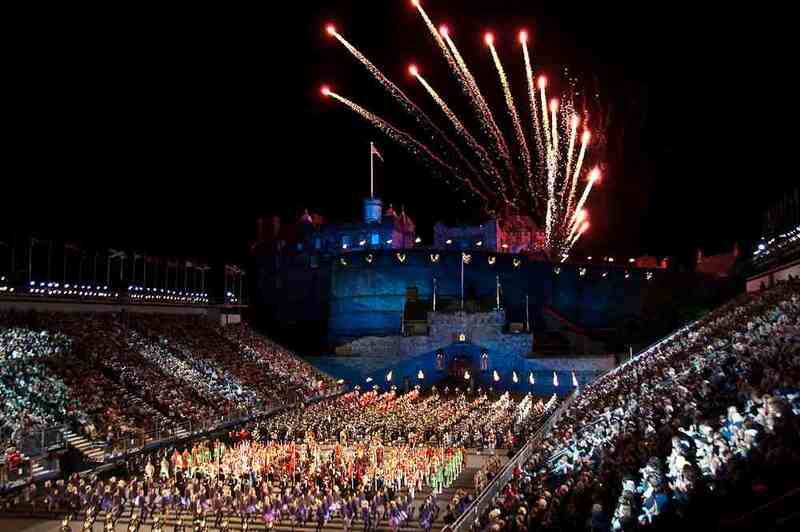 The Tattoo Grand Finale complete with fireworks launched from Edinburgh Castle. As exciting as the tattoo was, my words are inadequate to describe how stirring the performances were to see in person. If you ever learn of a military tattoo in your area, I urge you to experience it firsthand. You will not be disappointed.